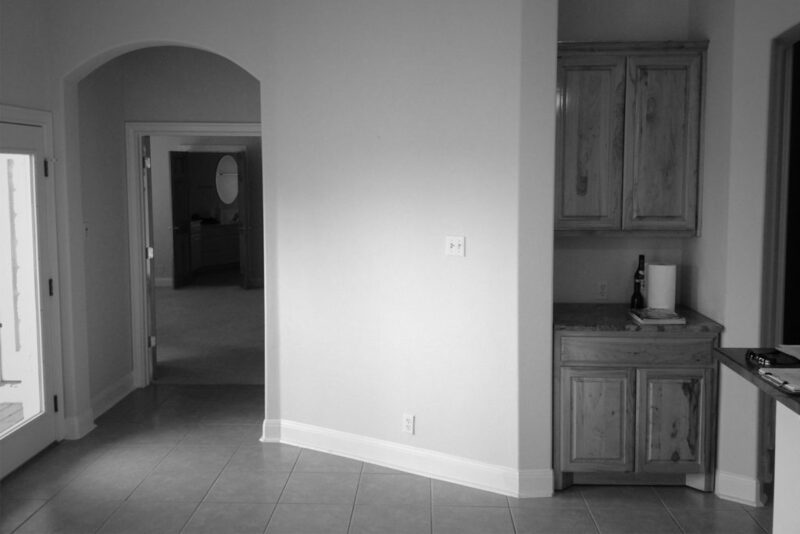 Before, this Spicewood area kitchen was a dark, cramped space with a lack-luster aesthetic. No redeeming qualities resounded from the kitchen and it felt more like a dungeon for a single cook then the bustling epicenter of the home. The homeowners desired a bright, elegant space fit for entertaining. They wanted an open plan that would relate to the living and dining areas nearby. They also wanted to be able to enjoy the beautiful view of the Texas Hill Country from the kitchen. The couple had very specific ideas about what they wanted the new kitchen to look like. The island had to be in the shape of an arc. However, the tiny footprint of the kitchen and the adjacent spaces made placing an island with the dimensions needed to create and arc challenging. Our team’s decision to angle the island parallel to the new range top wall not only maximized the size of the island and the flow of the kitchen, but was also the perfect angle from which the cook could converse with guests in both the dining and living spaces while enjoying the view beyond the windows. To further unify the use of the angles we ran 12×24 porcelain tile in the same direction, thus making the space appear longer and more open. As a hobby, the lady of the house enjoys cooking, therefore, high end appliances, including double ovens and a professional style range top and hood were a priority for her. Using Thermador’s Pro line we were able achieve the cooking performance she requested while granting the luxurious aesthetic they both desired. Once again, the kitchen’s tight dimensions did not leave us many options for expansion. In order to accommodate the double ovens we enclosed a superfluous passageway leading from the kitchen to the formal entry. 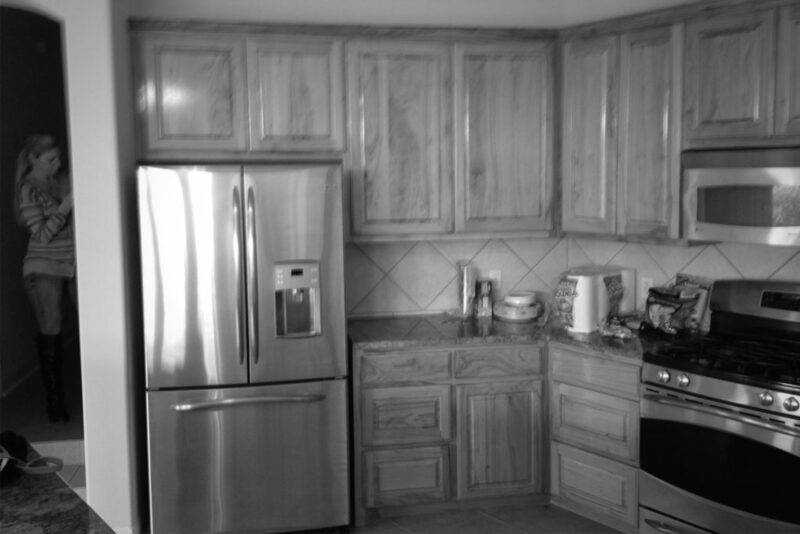 It provided the perfect dimensions for the ovens and a small pull out pantry. Among the other items on the homeowners’ wish list were lots of glass doors, lit cabinet interiors, a wine refrigerator, and a backsplash that evoked a sense of beauty and artistry. Wanting to introduce a pallet of blue-grays within the color scheme, the homeowners fell in love with the negative image veining of Calcutta Blue marble. From there, we found a gorgeous chrysanthemum pattern tile from Artistic Tile which pulled soft blues and pearly whites from the marble. The organic arrangement of each tiny ‘leaf’ of tile in their subtle hues gives the backsplash a refined feminine quality. 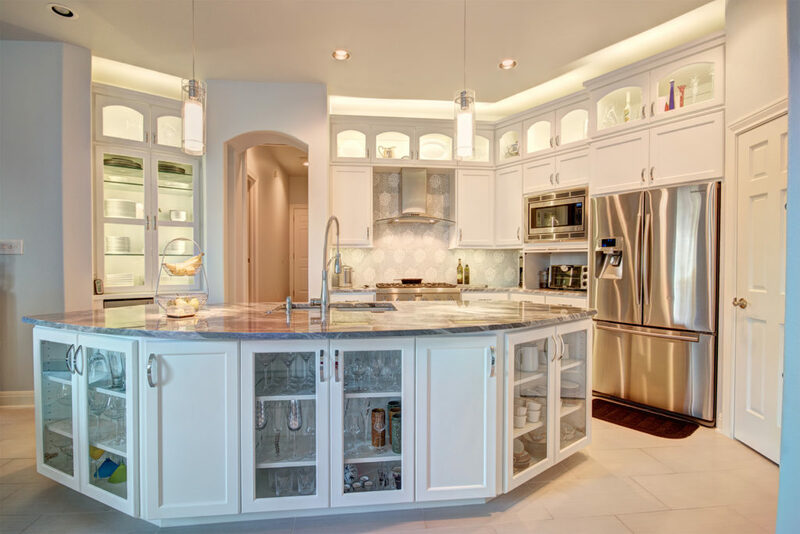 Single pane glass doors stacked on top of the lower level of cabinetry accomplishes two things. First, it helps the small kitchen appear larger and more lofty. Second, it grants leeway for lighting the space, both above the cabinets and within the cabinets. The glass doors allow the homeowner to display her collectables while providing indirect lighting for the space. The subtle eyebrow arch of the upper glass doors also reinforces the feminine quality of the design. Upon designing the new layout, we decided to move the range top and vent hood to the adjacent wall. Once we opened up the walls we found two issues. The first was realizing that all the walls were grossly out of square and plumb. We would have to reframe the walls in order to precisely fit all of the elements to maximize the usage of the space. We also realized that due to the change in floor elevations the top plate was at a lower height than the other walls. We had to reframe the top plate and construct custom ductwork in order to properly vent the range hood. Upon completion we were able to exceed our clients expectations in providing them a space that feels larger and functions better. The kitchen is now a breathtaking space that shines like a jewel in the nucleus of the home. 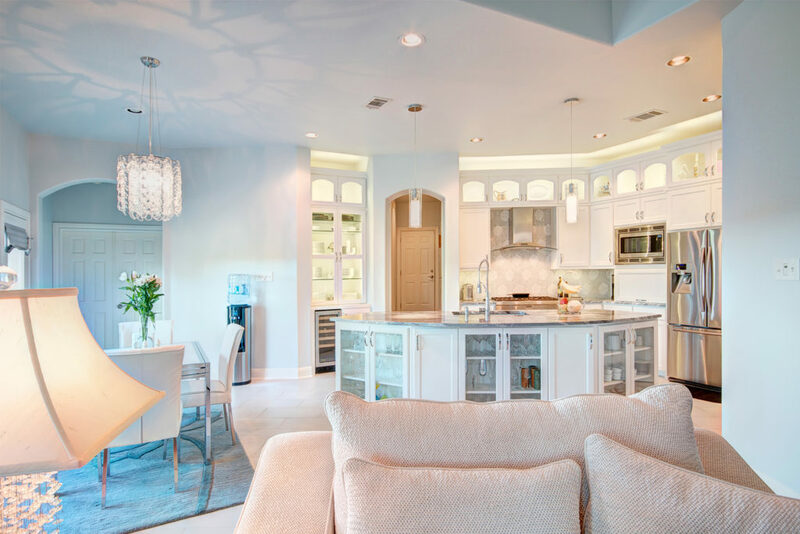 The island, especially, draws guests in while providing an aesthetically stunning barrier between the hostess’ space. The new design performs like a workhorse yet can double as an extension of a formal living space. It’s perfect for formal parties or casual get-togethers.